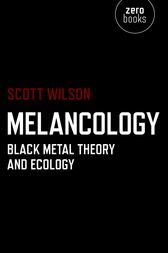 Melancology addresses the notorious musical genre black metal as a negative form of environmental writing that ‘blackens’ the cosmos. This book conjures a new word and concept that conjoins ‘black’ and ‘ecology’: melancology, a word in which can be heard the melancholy affect appropriate to the conjunction. Black metal resounds from the abyss and it is precisely only in relation to its sonic forces that the question of intervention in the environment arises in the articulation of melancology with ethics. That is, in deciding ‘which way out’ we should take, in deciding with what surpluses to dwell, with what waste, what detritus or decay in a process of unbinding with sonic forces that traverse an earth choking in wealth and death. The book thus provides a provocative and challenging contribution both to popular and intellectual debates on ecology. Scott Wilson is Professor of Media and Communication in the London Graduate School, Kingston University.